We analyzed the infection of the model plant Arabidopsis thaliana by the basidiomycete phytopathogen of cereals Sporisorium reilianum in order to use it as an experimental pathosystem model. Sterile plantlets of A. thaliana were grown on MS solid medium, and inoculated with haploid strains or mixtures of sexually compatible S. reilianum strains. Inoculated plants showed growth of filaments within their tissues, size reduction, a drastic increase in the formation of lateral roots, and a high production of plant pigments. Although symptoms were more severe in plants infected with sexually compatible strains, no spores were formed by the fungus. Among the pigments accumulated in the stunted plants we identified the anthocyanins cyanidin, cyanidin 3-glucoside, malvidin and pelargonidin. Congruently, the anthocyanin biosynthesis genes: chalcone synthase (CHS, AT5G13930) and dihydroflavonol reductase (DFR, AT5G42800) were over-expressed. The three genes encoding flavin monooxygenases: YUCCA7 (YUC7, AT2G33230), YUCCA8 (YUC8, AT4G28720), and YUCCA9 (YUC9, AT1G04180), and the transcription factor Jagged Lateral Organs (JLO, AT4G00220), all of them involved in the biosynthesis of auxins specific for root development, were also positively regulated. These data provide evidence that both haploid and the mixture of sexually compatible strains of S. reilianum can infect plants of A. thaliana; evidencing the usefulness of this pathosystem for the study of the genetic and metabolic reactions involved in S. reilianum virulence. The online version of this article ( https://doi.org/10.1007/s10658-018-1567-8) contains supplementary material, which is available to authorized users. This work was partially supported by Consejo Nacional de Ciencia y Tecnología (Conacyt), México. Thanks are given to Prof. Jan Schirawski, Institute of Applied Microbiology, RWTH Aachen University, Germany, for making available the S. reilianum strains SRZ2 and SRZ1. We also thank Mayela F. Salazar-Chávez from the Irapuato Unit of Centro de Investigación y de Estudios Avanzados del Instituto Politécnico Nacional (Cinvestav), Leandro A. Núñez-Muñoz and Brenda J. Vargas-Hernández from Zacatenco Unit of Cinvestav; Renata Cruz-Calderon from Instituto Tecnológico Superior de Los Reyes, TSLR; and Drs. José I. Reyes-Olalde, and Stefan de Folter from the Unit of Advance Genomics, Cinvestav, for their assistance respectively in strain maintenance, preparation of some reagents, statistical analyses, and microscopic analyses. 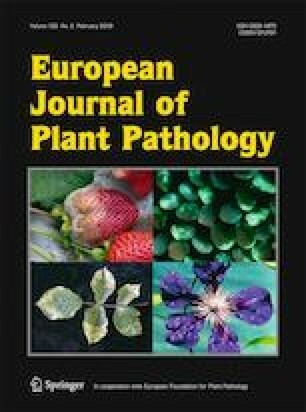 The authors declare that they are aware of the ethical responsibilities required by the European Journal of Plant Pathology for the submission of manuscripts. Also, they declare no conflict of interests and that they were informed of the submission of the manuscript. Doehlemann G., Ökmen B., Zhu W., & Sharon A. (2017). Plant pathogenic fungi. Microbiology Spectrum, 5. https://doi.org/10.1128/microbiolspec.FUNK-0023-2016. Martínez-Soto, D., Robledo-Briones, A. M., Estrada-Luna, A. A., & Ruiz-Herrera, J. (2013). Transcriptomic analysis of Ustilago maydis infecting Arabidopsis reveals important aspects of the fungus pathogenic mechanisms. Plant Signaling & Behavior. https://doi.org/10.4161/psb.25059. Martínez-Soto, D., Pérez-Garcia, F. E., & Ruiz-Herrera, J. (2016). Arabidopsis infection by haploid or diploid strains of Ustilago maydis reveals its capacity as a necrophic or biotrophic phytopathogen. Fungal Genomics and Biology. https://doi.org/10.4172/2165-8056.1000133. Olatunji, D., Geelen, D., & Verstraeten, I. (2017). Control of endogenous auxin levels in plant root development. International Journal of Molecular Sciences. https://doi.org/10.3390/ijms18122587.